Harry Richard Lewis of Felton, DE passed away, Sunday, January 27, 2019 at home. He was 88. Mr. Lewis was born October 12, 1930 in West Hartford, Connecticut to the late Arthur Lewis and Inez French Lewis, and was one of eleven children. He was raised in Wendell, MA and once worked for Erving Paper Company, where he met his wife. He served in the United States Army during the Korean War. Mr. Lewis worked at General Foods for 23 years, rising to the level of Production Manager, and after an early retirement served with the US Dept. of Agriculture and US Customs and Border Protection. He was a member of Christ Memorial Baptist Church, enjoyed working with the church, as part of his ministry he taught Sunday School at the J.T. Vaughn Correction Center. 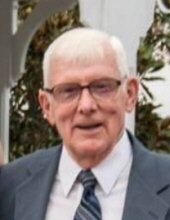 Mr. Lewis enjoyed camping, attending gospel music performances, watching golf, and was an avid New England Patriots fan. In addition to his parents he was preceded in death by his wife of 54 years, Marion Kelley Lewis; daughter, Pam Hurd; son, Daniel Lewis. He is survived by son, Michael Lewis and his wife Claudia of Ashburn, VA; daughter, Janice Whitney and her husband Bill of Dover; grandchildren, Andrew Lewis, Leigh Kring, Stephen Hurd, Rachel Hurd-Torres, Amanda Whitney and Jonathan Whitney; great grandchildren, Brooklyn Whitney, Benjamin and George Lewis, and Theodore Kring. Funeral services will be held 12 Noon, Friday, February 1, 2019 at Torbert Funeral Chapel South, 1145 E. Lebanon Road (Rt.10), Dover. Friends may call one hour prior. The family requests no flowers, please send contributions in his memory to either Delaware Hospice, 911 S. Dupont Highway, Dover, DE 19901 or Christ Memorial Baptist Church, 1160 E. Lebanon Road, Dover, DE 19901. To send flowers or a remembrance gift to the family of Harry Richard Lewis, please visit our Tribute Store. "Email Address" would like to share the life celebration of Harry Richard Lewis. Click on the "link" to go to share a favorite memory or leave a condolence message for the family.